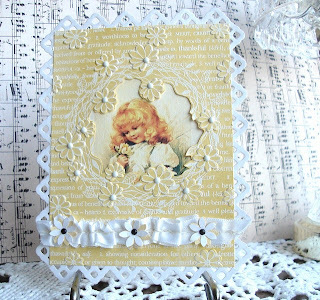 Vada's Blog Stamp Inks and Paper : GC-132 Color Challenge is “Yellow and White”. Red’s of Christmas, and Oh So Needed! I used a new stamp & emboss set from Hero Arts. It’s called Textured Impressions, and you get one cling mount stamp with matching embossing folder. This one is called Thankful #657768. I wet embossed it with white embossing powder and then dry embossed the image. Cut out the center, added my image. How easy is this? Added a few brads and ribbon and punched daisy. I hope you will take a break from all the Red’s and join use in this challenge at Gingersnaps. It runs until Jan 22 2012. Still gives you lots of time to get back into the Red’s of Valentines. Vada, what a sweet little girl! 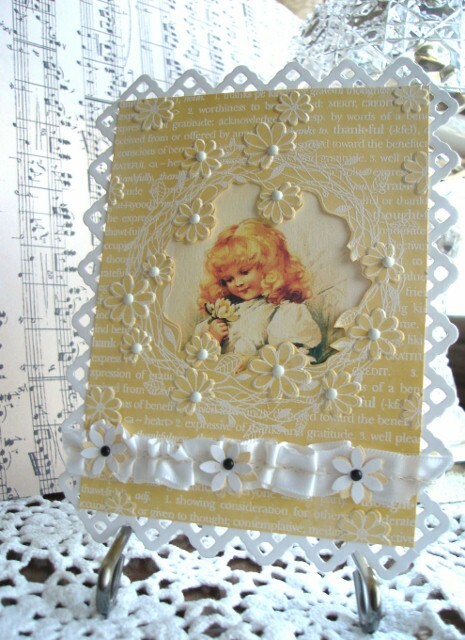 Love the dainty framing and flowers! Beautiful! Have a wonderful New Year! Hugs! She is so sweet and this card is gorgeous! Really sweet, charming card, Vada--perfect for this Gingersnap color challenge!